For the video game named Puzzle, see Puzzle (American Video Entertainment). For other uses, see Puzzle (disambiguation). Puzzle games focus on logical and conceptual challenges the possibility of a zero sum game is present , although often the games add time-pressure or other action-elements. Although many action games and adventure games involve puzzles such as obtaining inaccessible objects, a true puzzle game focuses on puzzle solving as the primary gameplay activity. Games usually involve shapes, colors, or symbols, and the player must directly or indirectly manipulate them into a specific pattern. In adventure games, some stages require solving puzzles as a way to advance the story. 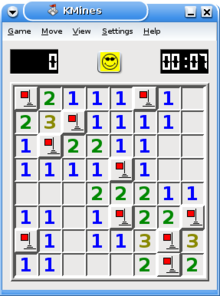 Minesweeper, a popular computer puzzle game found on many machines. There is a large variety of puzzle game types. Some feed to the player a random assortment of blocks or pieces that they must organize in the correct manner, such as Tetris, Klax and Lumines. Others present a preset game board or pieces and challenge the player to solve the puzzle by achieving a goal (Bomberman, The Incredible Machine). Puzzle games are often easy to develop and adapt, being implemented on dedicated arcade units, home video game consoles, personal digital assistants, and mobile phones. An action puzzle or arcade puzzle requires that the player manipulates game pieces in a real-time environment, often on a single screen and with a time limit, to solve the puzzle or clear the level. This is a broad term that has been used to describe several subsets of puzzle game. Firstly, it includes falling-block puzzles such as Tetris and KLAX. It includes games with characters moving through an environment, controlled either directly (Lode Runner) or indirectly (Lemmings). This can cross-over with other action genres: a platform game which requires a novel mechanic to complete levels might be a "puzzle platformer", such as manipulating time in Braid. Finally, it includes other action games that require timing and accuracy with pattern-matching or logic skills, such as the first-person Portal and The Talos Principle. Other notable action puzzle games include Team Ico's Ico, a linear, story driven game with puzzles based around traversing puzzle environments while protecting a helpless companion. Also made by Team Ico is Shadow of the Colossus, a game in which the player solves puzzles that involve finding and exploiting the weaknesses of giant beasts in combat. Nintendo's The Legend of Zelda: Breath of the Wild is another example of an action puzzle game, the primary objective being to seek out and solve physics-based puzzles which offer helpful upgrades for defeating the final boss. An early hidden object game was Alice: An Interactive Museum. Computer Gaming World reported in 1993 that "one disadvantage of searching through screen after screen for 'switches' is that after a while one develops a case of 'clickitus' of the fingers as one repeatedly punches that mouse button like a chicken pecking at a farmyard". Other early incarnations are the video game adaptations of the I Spy books published by Scholastic Corporation since 1997. Publishers of hidden object games include Sandlot Games, Big Fish Games, Awem Studio, SpinTop Games, and Codeminion. Examples of hidden object game series include Awakening, Antique Road Trip (both by Boomzap Entertainment), Dream Chronicles (PlayFirst), Mortimer Beckett (RealArcade/GameHouse), Mystery Trackers (by Elephant games), Hidden Expedition and Mystery Case Files (both by Big Fish Games). A reveal the picture game is a type of puzzle game that features piece-by-piece revealing of a photo or picture. A free online example is PicTAPr, which divides an image into 16 square pieces. A physics game is a type of puzzle video game wherein the player must use the game's physics to complete each puzzle. Physics games use realistic physics to make games more challenging. The genre is especially popular in online flash games and mobile games. Educators have used these games to demonstrate principles of physics. Popular physics games include The Incredible Machine, World of Goo, Crayon Physics Deluxe, Angry Birds, Cut the Rope, Peggle, Portal, Portal 2, Monster Strike and The Talos Principle. In tile-matching video games, the player manipulates tiles in order to make them disappear according to a matching criterion. The genre began with 1985's Chain Shot!. It includes games of the "falling block" variety such as Tetris, games that require pieces to be swapped such as Bejeweled or Candy Crush Saga, games that adapt the classic tile-based game Mahjong such as Mahjong Trails, and games in which are pieces are shot on the board such as Zuma. In many recent tile-matching games, the matching criterion is to place a given number of tiles of the same type so that they adjoin each other. That number is often three, and the corresponding subset of tile-matching games is referred to as "match-three games." There have also been many digital adaptations of traditional puzzle games, including solitaire and mahjong solitaire. Even familiar word puzzles, number puzzles, and association puzzles have been adapted as games such as Dr. Kawashima's Brain Training. Puzzle video games owe their origins to brain teasers and puzzles throughout human history. The mathematical strategy game Nim, and other traditional, thinking games, such as Hangman and Bulls and Cows (commercialized as Mastermind), were popular targets for computer implementation. The University of Tokyo's 1979 Heiankyo Alien for the PC-8001 and arcades was an early "trap 'em up" puzzle action game. It was a precursor to later puzzle action games such as Lode Runner. Another early action game with puzzle elements was Konami's Loco-Motion (1982), elements of which are seen in Pipe Mania from LucasArts (1989). Blockbuster, by Alan Griesemer and Stephen Bradshaw (Atari 8-bit, 1981), is a computerized version of the Rubik's Cube puzzle. Snark Hunt (Atari 8-bit, 1982) is a single-player game of logical deduction, a clone of the 1970s Black Box board game. Sokoban's crate-pushing puzzles from 1982 have been widely cloned and its core mechanic incorporated into other games. Other early puzzle games include puzzle-platformers such as Door Door (1983), Lode Runner (1983), and Doki Doki Penguin Land (1985). 1984's Puzzle Panic for the Atari 8-bit computers specifically uses the word puzzle in the game's title. 1984 also saw the release of the action-puzzle game Boulder Dash, where the goal is to collect diamonds while avoiding or exploiting rocks that fall when the dirt beneath them is removed. It led to a number of clones categorized as "rocks and diamonds games." In 1985, Chain Shot! introduced removing groups of the same color tiles on a grid, then the remaining tiles falling into the created gap. Uncle Henry's Nuclear Waste Dump (1986) has similarities to Tetris, though it was published prior to Tetris reaching the US, and the author claims he hadn't seen it. Tetris is credited for revolutionizing and popularizing the puzzle genre. The game was created by Soviet game designer Alexey Pajitnov in 1984, who was inspired by a traditional puzzle game named Pentomino in which players arrange falling blocks into lines without any gaps. The game was a moderate success when released by Spectrum Holobyte for MS-DOS in 1987 and Atari Games in arcades in 1988, but it sold 30 million copies on the Game Boy alone. 1991 saw the release of Lemmings. The game involves a series of creatures who mindlessly walk into deadly situations, and the player assigns jobs to specific lemmings to guide the swarm to a safe destination. 1994 was marked by a surge in interest in mahjong video games from Japan. When Minesweeper was released with Windows 95, mainstream audiences embraced using a mouse to play puzzle games. In a 1996 interview, Claude Comair recommended that budding video game developers start learning with a puzzle game. He elaborated that the genre provides a good beginning test of programming skill and creativity, since it does not allow the developer to substitute audiovisual impact for genuine imagination. In 2001, PopCap Games released a graphically-enhanced clone of an obscure 1994 MS-DOS game, Shariki, where the player must touch groups of three or more jewels on a grid, causing them to disappear and new stones to fall into place. A decade later, the match three mechanic was the foundation for popular games, including Candy Crush Saga and Puzzle & Dragons, both from 2012. By 2014, puzzle games had become the largest genre in the iOS App Store. ^ a b c Miller, Skyler. "History of Puzzle Games". GameSpot. Archived from the original on 2010-02-04. Retrieved 25 September 2016. ^ a b "Action Puzzle Games". allgame. Rovi. Retrieved 2010-01-20. ^ "Capcon looks back on 2009, teases new stuff for 2010". ^ Magrino, Tom (August 4, 2009). "Braid tangled up in PSN". GameSpot. CBS Interactive. Archived from the original on July 7, 2012. Retrieved 2010-01-20. ^ Edge staff (June 15, 2007). "Report: Half-Life: Episode 2 Coming Oct. 9". Edge. Future. Archived from the original on September 6, 2012. ^ a b c "Ally Noble Desert Island Disks". Retro Gamer. Imagine Publishing (53): 79. Hidden object games ... For example, you're a detective looking for clues in a picture ... they might be in monochrome on the wallpaper or peeping out from behind something. ^ a b George Roush (October 17, 2008). "Everest: Hidden Expedition iPhone Review". IGN. Archived from the original on February 24, 2009. ^ Albert Kim (September 30, 2008). "Casual Games: 'Peggle Nights' and 'The Lost Cases of Sherlock Holmes'". EW.com. Mystery titles, particularly hidden-object games, have become a hugely popular segment of the casual-game market. ^ Reveaux, Tony (April 1993). "A Trip Into The Odd Land of Multi-Media". Computer Gaming World. p. 40. Retrieved 6 July 2014. ^ "First casual game with a 'Collector's Edition'". Game Hunters. USA Today. November 27, 2009. Retrieved 2009-11-30. ^ Ward, Mark (2005-05-14). "Game physics starts to get real". BBC News. Retrieved 2010-03-27. ^ Thompson, Jane (2007-06-15). "Video games getting deeper". The Star. Retrieved 2010-03-27. ^ Jim Thompson; Barnaby Berbank-Green; Nic Cusworth. Game design course: principles, practice, and techniques. Wiley. pp. 30–31. ^ Parish, Jeremy (28 August 2014). "Greatest Years in Gaming History: 1983". ^ "Blockbuster". Atari 8-bit Forever. Archived from the original on 2015-12-07. ^ Powell, Jordan (February 1983). "Ten Best from APX". Antic. http://www.atarimagazines.com/v1n6/tenbestfromapx.html. ^ "Door Door". GameSpot. Archived from the original on 28 July 2012. Retrieved 13 September 2011. ^ "DokiDoki Penguin Land for SG-1000 - GameFAQs". Retrieved 3 April 2017. ^ Juul, Jesper. "Swap Adjacent Gems to Make Sets of Three: A History of Matching Tile Games". ^ "Accidental Innovation, Part 1". ^ Rusel DeMaria; Johnny L. Wilson. High score! : the illustrated history of electronic games. McGraw Hill. ^ Mark J. P. Wolf. The video game explosion: a history from PONG to Playstation and beyond. Greenwood Publishing Group. ^ Jeff Fulton; Steve Fulton. The Essential Guide to Flash Games. Apress. ^ "So What Do they Teach you at Videogame School?". Next Generation. No. 25. Imagine Media. January 1997. p. 8. ^ Hester, Larry (October 21, 2013). "Inside Bejeweled: An Interview with Executive Producer Heather Hazen". Complex. ^ Hill, Simon (December 15, 2014). "Games rule the iTunes App Store: Most popular genres revealed". This page was last edited on 10 April 2019, at 06:39 (UTC).